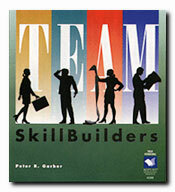 Use these quizzes, worksheets and tips to build teams that work. Teamwork can be rewarding, effective and challenging. Understanding the benefits of teamwork and how to avoid sabotaging is critical and useful for both the individual and the employer. This collection gives you lots of training possibilities: use the quizzes as contests in staff newsletters; stimulate workshop participants with an engaging worksheet; post tip sheets in a break room. Why Cant Work Be More Like Sports?